Stonehaven Cubby Coat Rack - Woodworking Plans! 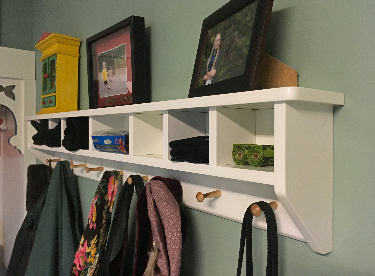 This inexpensive and easy-to-build wall-mounted coat rack with cubbies keeps all your outerwear and accessories in one place.. Perfect for halls, kitchens or mudrooms - wherever you may be short on closet space – what you need is always ready to grab and go! The assembled Cubby Coat Rack is 48"w x 9"h x 5"d.
— all in a 9-page printable PDF file that you won't find anywhere else. These woodworking plans are suitable for any DIY'er with beginning skills and typical woodworking shop tools.